"Brit, why don't you just leave the cookies in the car?" "But I don't want them to melt." "Umm...don't you make cookies in the oven? How exactly, pray tell, is this already-baked cookie going to melt?" In her defense, she was referring to the chips in the cookies. Not in her defense, these particular cookies did not have any chips in them. Saturday night, her friends from Provo came to have a sleep-over with us, so Brit and I had to share a bed. Something I am so not used to. 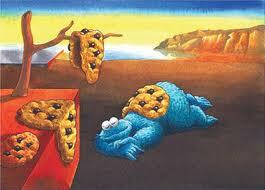 I found myself dreaming about her melting cookies. I had to save them. I reached to get the cookies and place them in the refrigerator to stop the demise of deliciousness. Then a giant cat hissed ferociously in my ear to keep me from saving the treats. I was precariously hovering over my sister, reaching for who knows what, and my hair was dangling in her face, obstructing her breathing. She was making very loud choking/hissing noises thanks to my lovely locks. I quickly put myself back into the appropriate sleep-time position and hoped she didn't wake up mad at me. I told her the story the next morning and she had a minor giggle fit. Whew. Ok this story trumps Meg's Wet Willy incident. Seriously trying to not stop breathing from laughing so hard.